THEIR apartments boast stunning city views and now they have the outdoor entertaining spaces to match. Top floor renovators Kim and Chris and Julia and Sasha tied to take out tonight's room reveal on The Block, delivering near-perfect terraces complete with outdoor kitchens and living areas. 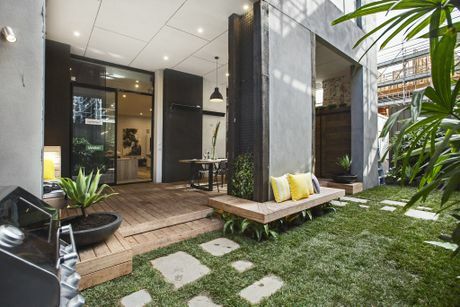 Kim and Chris proved they had the best budgeting skills, with enough money to fit out their terrace with a fridge, barbecue, lighting and even built-in sprinklers to water their hanging plants. "This is a light, bright, friendly space that I'm completely in love with," judge Darren Palmer said. "They haven't missed a trick in here; this is the crescendo." 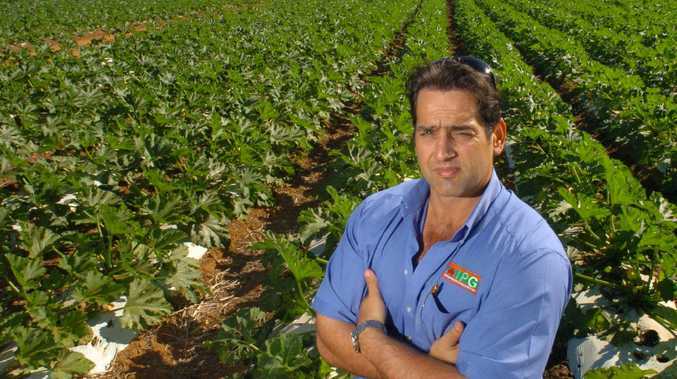 But the judges also expressed their frustration at the couple's inconsistency throughout the series. "This is very, very pretty," Shaynna Blaze said. "I wish they started with this style. 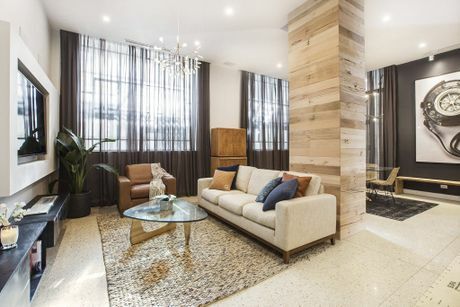 I think the style really suits this apartment ." The five teams also had to fix up their re-do rooms this week. Kim and Chris finished their apartment's loggia and rectified their main bathroom. "Kim and Chris are having a great week," Palmer said. 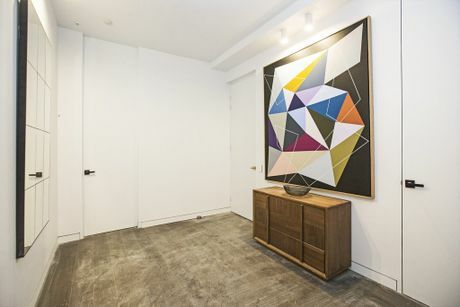 "This is the most amazing master suite I've ever seen on The Block." Julia and Sasha won equal best marks for their sophisticated outdoor terrace featuring some of Julia's best styling work of the season. 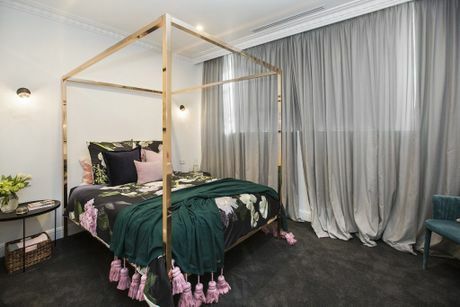 "This is really showing the girls at their best; it's simple and elegant and beautiful and appropriate to the apartment," Neale Whitaker said. 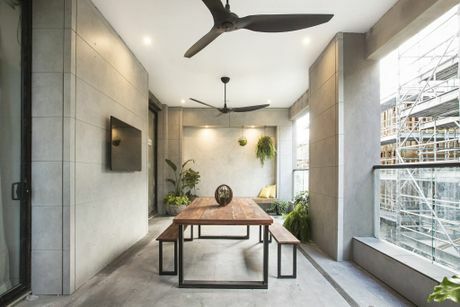 "You want your potential buyer walking away from this apartment dreaming of the first dinner party on the outdoor terrace." The women were also praised for fixing up their two re-do rooms: their guest bedrooms. "This has just been taken to the next level," Blaze said. "We really see Julia and Sasha have their confidence back, They've had a few wobbles, but now we see this is confidence. The girls have the prettiest apartment I have seen on any Block." 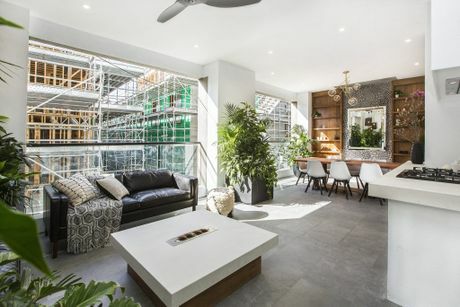 Queenslanders Will and Karlie finished second for their luxuriously large terrace featuring the only grassed courtyard out of all of the apartments thanks to their ground floor position. "This is like an urban oasis," Blaze said. "Look at this extra grass they have that no other apartment has; this is an incredible bonus. "I can't fault their style. What a beautiful way to finish." But the high school sweethearts were let down by their efforts in their re-do room, the living room. "There are a lot of things to love in this apartment but this living room will never be one of them," Whitaker said. "I think Will and Karlie know this isn't going to affect the sale of their apartment." 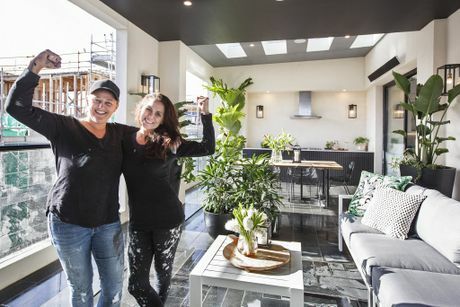 Baby boomers Dan and Carleen, who had tied with Will and Karlie last week for their perfect kitchens, divided the judges with their outdoor space. "There's very little out here that relates to what they've done inside, but for me the compensation is that it feels beautiful," Whitaker said. "I think they wanted their terrace to feel like a resort. Overall I love the room they've created here." Blaze disagreed though, saying the dining table and feature wall felt disjointed from the rest of the terrace. "We haven't disagreed much on this series, but I don't feel good in here," she said. The judges did all agree, though, on Dan and Carleen's re-do room, the guest bedroom. "There's a real level of sophistication in here now," Whitaker said. Ben and Andy finished last and the result came as no surprise to the Geelong schoolteachers, who pushed themselves and their budget to the max. 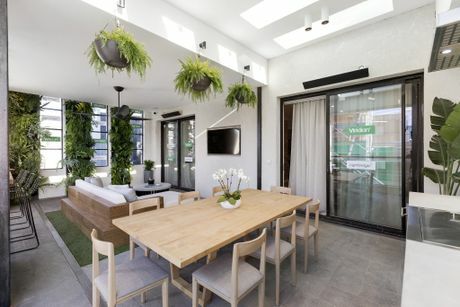 Their stark outdoor terrace, which had a table, wall-mounted television and plants, lacked the soft details of the other apartments. "This is an outdoor space made by two men for a group of men," Palmer said. "It does feel like a man cave." They sacrificed some of their terrace budget to be able to complete their additional fourth bedroom with their loggia doubling as a study. The room was not up for judging. "No wonder they didn't finish their terrace so well; they had a whole other bedroom to do," Whitaker said. "They spread their money I tell you. They won't win any points for styling from me. I can feel their exhaustion; they're crawling to the finish line." 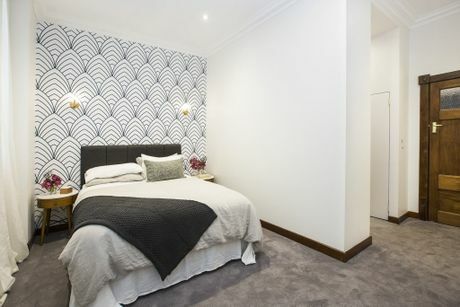 They were praised for their re-do room, the hallway, which now makes a better first impression. "This is what I would have liked to see (the first time)," Palmer said. "This artwork here is much better than what they had before. The lighting in the hallway has really lit up that space." While their apartments may be finished, the work isn't over yet for the teams. 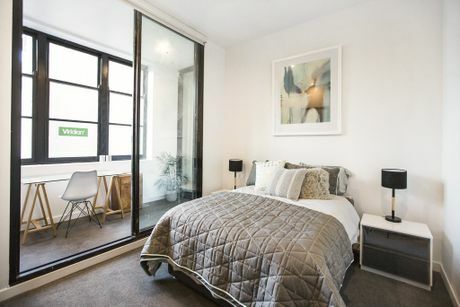 This upcoming week they will start their renovations on the extra challenge apartment, competing for money off of the reserve prices of their apartments on auction day.